President Donald Trump vowed in his State of the Union speech on Tuesday to build a border wall, which is a source of a deep partisan divide, and said Democratic attempts at “ridiculous partisan investigations” could damage U.S. prosperity. Trump spoke to a joint session of the U.S. Congress facing political discord over his demands that Democrats end their opposition to funding for a U.S.-Mexico border wall he says is needed to stem illegal immigration and smuggled drugs. During his 82-minute speech, he outlined his political priorities without providing specific policy details. 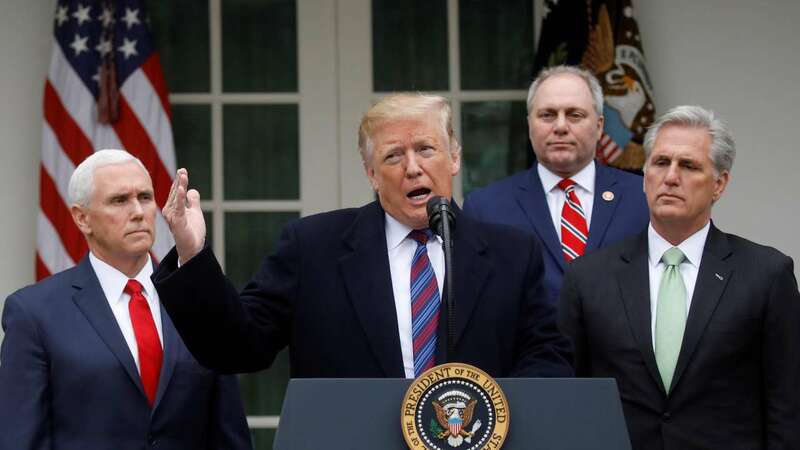 Trump called illegal immigration “an urgent national crisis,” but stopped short of declaring a border emergency that would allow him to bypass Congress for wall funding. Instead, he urged Democrats and Republicans to find a compromise by a Feb. 15 deadline. “In the past, most of the people in this room voted for a wall, but the proper wall never got built. I will get it built,” Trump said in the House of Representatives chamber, with his main Democratic adversary, new House Speaker Nancy Pelosi, watching over his shoulder. Trump warned, without offering evidence, that Democratic efforts to investigate his administration, along with the possibility of U.S. involvement in wars abroad, would endanger the U.S. economy. His remarks came as Democrats who now control the House planned a series of probes into the Trump administration and his personal finances, while Special Prosecutor Robert Mueller investigates Russian meddling in the 2016 presidential election and possible collusion between the Trump campaign and Moscow. Russia denies meddling and Trump has said there was no collusion. Democratic Representative Val Demings called Trump’s remarks shameful and said the investigations would proceed. “We’re not going to stop,” she said. Apart from lauding economic accomplishments – unemployment near a five-decade low and manufacturing job growth among them – Trump’s speech was light on new initiatives to further stoke growth in an economy seen as losing momentum as it began 2019. Financial markets were largely subdued as Trump delivered his speech. “It was pablum, without specifics,” said Tim Ghriskey, chief investment strategist at Inverness Counsel in New York. Trump’s speech unfolded largely in a civil fashion with Cabinet members, military commanders and several Supreme Court justices in attendance at the annual presidential address to Congress. Many Democratic women lawmakers wore white to celebrate 100 years of women having gained the right to vote. Republicans cheered on the president, while Democrats grimaced or shook their heads but held their fire and applauded at non-partisan moments, such as when two Holocaust survivors were recognized. Despite a lack of concrete progress in persuading North Korea to give up its nuclear weapons program, Trump said his second summit with North Korean leader Kim Jong Un would take place on Feb. 27 and 28 in Vietnam. It is expected to be either in Hanoi or Da Nang. From China to Venezuela to Afghanistan, Trump devoted a large section of his speech to foreign policy, saying a trade deal was possible with China if Beijing agrees to “real structural change.” The world’s two largest economies are in talks to try to hammer out an agreement to end a trade war. Trump hailed peace efforts unfolding between his administration and Taliban insurgents in Afghanistan and said if a deal could be reached, it would allow him to bring some U.S. troops home after 17 years of war spawned by the Sept. 11, 2001, attacks. “As we make progress in these negotiations, we will be able to reduce our troop presence and focus on counterterrorism,” he said. He also hailed allied gains against Islamic State militants in Syria and reiterated his plan to withdraw U.S. troops from that war zone, despite comments earlier in the day from a top U.S. general, Joseph Votel, that a U.S. pullout could prompt a resurgence in the militancy. “Great nations do not fight endless wars,” said Trump, whose withdrawal plans are opposed by many congressional Republicans. Trump also denounced Venezuelan President Nicolas Maduro, who the United States and a number of Latin American and European countries accuse of being an illegitimate leader after last year’s disputed election. Trump used part of his speech to offer a spirit of compromise, particularly in areas such as lowering the price of prescription drugs and funding a $1 trillion upgrade in U.S. roads, bridges and other infrastructure. Driving the two parties apart is Trump’s insistence on funding for the border wall. Pelosi, who frequently sat stony-faced through Trump’s address, has shown no sign of budging from her opposition to Trump’s wall-funding demand. The Republican president appeared in the House chamber just weeks after his demand for $5.7 billion in funding for the U.S.-Mexico wall triggered a historic 35-day partial government shutdown that more than half of Americans blamed him for, according to Reuters/Ipsos polling. “Simply put, walls work and walls save lives. So let’s work together, compromise, and reach a deal that will truly make America safe,” Trump said. For all of Trump’s talk about political unity, he could not resist denouncing liberal Democrats who have gained power in the House, best personified by Representative Alexandria Ocasio-Cortez, who has proposed a 70 percent tax on the richest Americans. “We are born free, and we will stay free. Tonight, we renew our resolve that America will never be a socialist country,” Trump said. As Trump spoke, Ocasio-Cortez could be seen smiling broadly.